Living where we live (deep in the Midwest), we’ve pretty much come to dread the months by the names of December, January, February, and sometimes March. And this winter, in particular, has been especially dreadful. 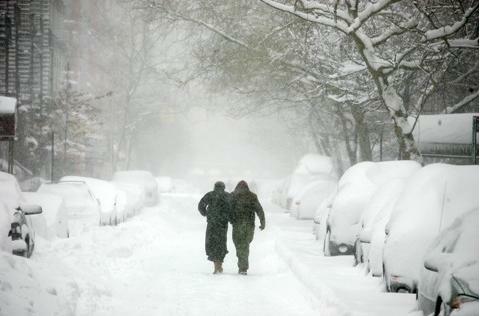 Sub-zero temperatures, snow up to our knees, icy winds that could cut right through steel…. Yeah. However, we’re glass-half-full types, so we’ve decided to take a positive spin on this frigid time of year. No, we’re not learning to love winter. We’re happy just finding ways to hate it a little bit less. We share those reasons with you, below. The warmer, the woolier, the better. Those Irish fishermen’s wives sure knew what they were doing when they picked up their needles to knit the original Aran sweaters. May we suggest some perfectly delightful men’s Irish wool sweaters and women’s Irish wool sweaters to keep you toasty? Take that, Old Man Winter! The original Irish coffee was invented in the 1940s for a specific purpose: to warm up travelers arriving at Shannon Airport in the days when a transatlantic flight meant 12 long hours in a lumbering plane. We can travel from the U.S. to Ireland much more quickly these days, but that warming, bracing brew is still what the doctor ordered. In a small, prewarmed mug, dissolve the sugar in the coffee. Stir in the whiskey. Slowly pour in the cream over the back of a spoon so the cream forms a distinct layer on top. Don’t stir—sip through the cream. Ahh. It may be blizzarding outside, but there’s (almost) no better way to pass the time when we’re stuck inside than curling up with a good movie. Our friends at Irish Central recommend a few great Irish ones. A charming comedy set in a tiny, rural Irish town. When lottery winner Ned Devine is found dead—lottery ticket in hand and all—the townsfolk band together to fool the authorities into thinking Ned is alive, so they can receive the cash and share it. A beautiful, romantic, original musical set in the streets of Dublin. Glen Hansard of The Frames plays a street musician who meets a fellow musician and Czech immigrant (Marketa Irglova). Together they work through pain, the past, and new love through captivating music. Hansard and Irglova won the Oscar for Best Original Song (2007). An Oscar-nominated film based on the real-life experiences of Gerry Conlon, the alleged leader of the Guildford Four. Daniel Day-Lewis stars as Conlon, a Belfast man wrongly imprisoned for the 1974 IRA bombing of a pub in the U.K. Nominated for seven Academy Awards including Best Picture, “In the Name of the Father” shows one man’s 15-year struggle for his innocence and for truth. A story about an Irishman’s love of his land from director Jim Sheridan. Bull McCabe (played by Richard Harris, who was nominated for an Oscar for the role) is a farmer in Ireland’s rural west. When his field is threatened to be sold to an outsider, Bull will do anything in his power to stop it from happening. An unforgettable film about the conflict between “old” and “new” Ireland. A true story about an Irishman who overcomes his disability to become an amazing painter, poet, and writer. Another film from Jim Sheridan, it documents the extraordinary life of Christy Brown (Daniel Day-Lewis), a working-class Irishman born with crippling cerebral palsy. With the encouragement of his mother, played by Brenda Fricker, Christy learns to write and draw with his only functional limb—his left foot. Both Day-Lewis and Fricker won Academy Awards for their roles. A beloved classic starring John Wayne and Maureen O’Hara. This romantic drama from director John Ford tells the story of Sean Thornton, a retired American boxer who relocates to Ireland to reclaim his family’s farm, and Mary Kate Danaher, the fiery Irishwoman he falls in love with. Though its portrayal of Ireland may be a bit outdated, the film is a genuine tribute to Eire, and it’s both an American and Irish favorite. A legendary Irish film about a group of down-and-out Dubliners who form a soul band. Jimmy Rabbitte has dreams of creating the ultimate soul group, and succeeds in bringing together a bunch of talented, eclectic characters. But eventually personalities clash, and the survival of the band is threatened. This adaptation of the Roddy Doyle novel featured a relatively unknown cast at the time, but was welcomed with critical acclaim and a successful box office run. It seems, these days, that every other day is a holiday. Oh sure, there are the biggies, like Christmas, July Fourth, and Thanksgiving, but let’s not forget the other ones, like Groundhog Day, Presidents Day, and National Pie Day. What’s that? Yes, you heard right—National Pie Day, which happens to fall each year on January 23 and has done so since it was established in 1986 by the National Pie Council. OK, so National Pie Day is an “unofficial” national holiday, but that’s no reason not to celebrate it. I love a good pie more than almost anything (except chocolate chip cookies, but that’s another discussion for another day). So, I thought, what better way to mark this special day than by spending a few moments contemplating the pie. Did you know, for example, that the first pies appeared around 9500 BC in the Egyptian Neolithic period or New Stone Age? Sometime before 2000 BC, a recipe for chicken pie was written on a tablet in Sumer. 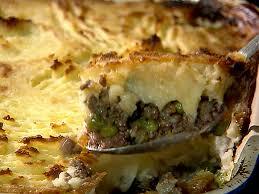 Ancient Greeks are believed to have originated pie pastry, and a first century Roman cookbook mentions pies. So what has this to do with All Things Irish? Glad you asked. Britain and Ireland have had a love affair with “pyes” since the 12th century that continues today. Think Cornish pasties, steak and kidney pies, and, of course, those unfortunate four-and-twenty blackbirds baked in a pie. We at Ever Irish Gifts are not going to get quite so ambitious today, however. When I think of Irish pies, two immediately come to mind—one savory and one sweet. I’m talking about Irish Shepherd’s Pie and Bailey’s Irish Cream Pie. Could anything sound more delectable than a traditional Irish comfort food and a totally decadent dessert? Could there be a more appropriate way to celebrate National Pie Day, Irish style? Here is a fabulous recipe for each. Enjoy, and happy Pie Day! Shepherd’s pie is believed to have existed since around 1791, when potatoes became an available, affordable crop to the poor. This dish was a perfect way to stretch leftover roasted meat then, and it’s still a hearty and delicious way to ward off winter’s chill today. 2. Saute carrots in the olive oil until starting to get tender. 3. Add in the onions and saute for a minute or two then add the meat. 4. Season with black pepper and thyme. 5. Cook until meat is browned then drain fat. 6. Add the butter and peas. 7. Sprinkle with flour and stir well to incorporate. 8. Add tomato paste, wine, and Worcestershire sauce. 9. Let this reduce slightly then add the chicken stock. Allow to reduce down until you have a thick, meaty gravy. Season with salt to taste. 10. Remove from heat. Grease a 9″ x 13″ ovenproof casserole dish and add the meat/gravy mixture. 11. Spoon or pipe the mashed potatoes over top. Brush with egg. 12. Bake for about 20 minutes or until the potato is nicely browned on top. Bailey’s Irish Cream liqueur is so creamily sweet and luscious that it could be a dessert all by itself. Add in Oreos, cream cheese, and chocolate and you’ve got heaven on a plate—no baking required! 1. In a food processor, blend Oreos until crushed to a fine crumb. Pour into bowl and mix in ½ stick melted butter. Press mixture into a 9-inch pie dish. Cover and chill for at least 1 hour. 2. To melt the chocolate, place a heat-proof bowl on top of a saucepan filled with about 1 inch of briskly simmering water. The bowl should not touch the water. Add the chocolate chips to the bowl and stir frequently until the chocolate melts. Watch carefully so that the chocolate does not burn or separate. Set aside. 3. In the bowl of an electric mixer, beat cream cheese for 2 minutes. Transfer whipped cream cheese into a clean bowl. In the mixing bowl, whip the heavy cream and ½ cup of Bailey’s until stiff peaks form. Once whipped cream is formed, fold in whipped cream cheese, melted chocolate, and remaining ½ cup of Bailey’s. Pour filling into the prepared pie dish. Cover and chill for at least 4 hours or overnight. 4. 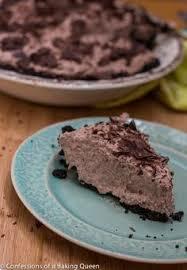 Using a vegetable peeler, peel curls of chocolate from the frozen candy bar and use to garnish top of pie.